The new format Korean League kicked off last week with last year’s champion Woori Bank remaining the team to beat. This season the Korean League decided to cap their foreign players to just one per team. In it’s most recent years each team fielded two foreigners. Foreigners suiting up this season are, Cheyenne Parker for KEB Hana Bank, Aisha Sutherland for Samsung, Shekinna Stricklen for Shinhan Bank S-Birds, Kayla Thornton for KB Stars, Damiris Dantas for OK Savings Bank and Krystal Thomas for Woori Bank. Thomas and Parker are the only two players without Korean League experience. KB Stars were the only team that selected a guard in this year’s draft. They were able to do so because they have 6’5” Korean League star post player Ji-su Park who made her WNBA debut last season for the Las Vegas Aces. There is one game everyday except for Tuesdays. The season will run from November 3rd through March 29th. The draft was conducted on Tuesday morning in South Korea while it was still Monday night in the United States. An even bigger change was made in the league format this year with the number of foreigners per team decreasing from 2 to 1, leading to a decrease in the size of the draft. That did not do much to change the popularity of the draft as 115 players applied for the 6 spots. The non-playoff teams were put into one pot and the playoff teams were put in the other pot as the pick orders for each half were determined by lottery. KEB hopped above KDB to land the first pick while there was no change in order for the last three picks. With each team only getting one player, the days of teams being able to pick players of different positions or styles were no longer possible. KEB opted for Cheyenne Parker first as a player who is likely to be able to do everything required of a foreign player in the new system. KDB Life opted for Damiris Dantas after her successful season in this league. Samsung Life also went with experience in the league and more versatility as they picked Tianna Hawkins. The trend for experience continued with Shinhan Bank picking Natalie Achonwa. 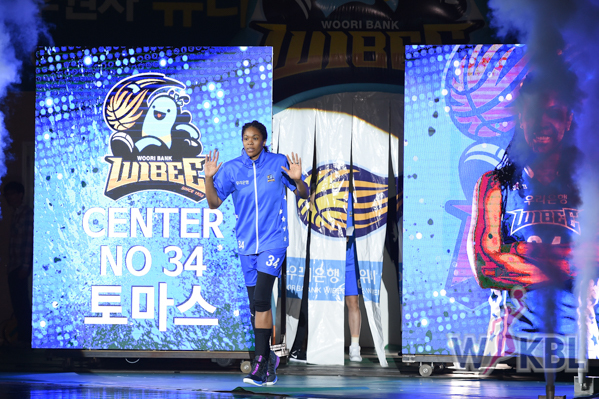 All eyes were on the next pick with Korea Bank having the greatest flexibility and they opted for another player with history in the league in Kayla Thornton. The champions had the last pick and they drafted Krystal Thomas to try to maintain their dominance. The much anticipated WKBL Finals began on Saturday with first placed Wibee Woori Bank taking on second placed KB Stars. During the regular season KB took a 4-3 series lead over Woori. At the conclusion of the regular season Woori Bank replaced their foreign player Destiny Williams with Chicago Sky’s Amber Harris. Harris most recently played in the Chinese League which she finished in December. Natalie Achonwa had a huge double double of 15 points and 17 rebounds in Game 1 of the WKBL Finals. After winning the semi-finals in three games, KB only had one day to rest before the finals began. Meanwhile, Woori were able to await their opponent as the first placed team automatically advances to the finals. In a sold out gym, where KB fans seemed to outnumber the home fans, the game did not disappoint. Woori Bank came out playing well, it was obvious that they were more fresh than KB as they held onto a six point lead after the first period. KB kept pace with the hosts in the second and cut the lead to four at the half. Things picked up in the third where both foreign players are allowed to play at the same time. KB came out strong led by Monique Currie who led her team in scoring for the night with 18 points. At one point KB took the lead 40-37 with four minutes left in the third but Woori quickly went on a 9 to 2 run to recapture the lead heading into the fourth. With a four point lead heading into the fourth, Woori were able to keep KB at a short distance. For every basket KB made, Woori had an answer. They were able to take advantage of KB’s turnovers and took a ten point lead with four minutes remaining in the game. KB fought back and cut the lead to three with less than two minutes to play but were unable to complete the upset. Natalie Achonwa was excellent for the winners as she finished with 15 points and 17 rebounds. Game two will be played in Asan, Woori’s home gym, on Monday the 19th. Check out some action shots from the game here. 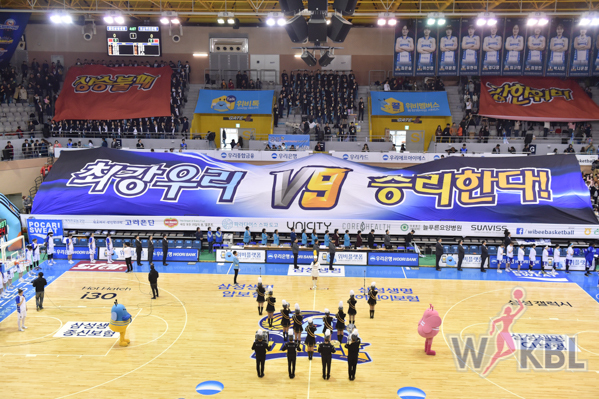 The Korean League (WKBL) began their playoffs on Sunday March 11th. The top three teams advance to the playoffs, while the first placed team automatically advances to the championship round. Woori Bank finished the season in first place with KB Stars and Shinhan S-Birds in second and third. Woori and KB sat atop the standings for the entire season where KB came close to stealing the first place position from Woori who have won the past six championships in the Korean League. In the best of three series KB hosted Shinhan at home for game one. During the regular season KB had a 4-3 record against the S-Birds. In what most thought would be a competitive game, KB came out the gate on fire as they took a 25 to 12 lead to end the first quarter. In the second, Shinan kept the score close and KB took a 12 point lead into the half. KB picked things back up in the third and kept the game out of reach for Shinhan. KB saw four players score in double figures with Damiris Dantas leading the way with 19 points and 6 rebounds. Kim Damby lead all scorers for the S-birds with 12 points. KB hopes to end the series in two games to have more time to prepare for the championship round. Game two will be played on Tuesday on Shinan’s home court. Damaris Dantas is averaging 22 points and 12 rebounds for KB Stars. Still without their leading scorer, Samsung faced a KB team looking to redeem their last two losses. KB Stars controlled the game from the start and played excellent until the fourth quarter when they allowed Samsung to outscore them 19 to 11. Despite KB’s lousy fourth quarter they were able to get back on the winning side of things. Damaris Dantas has been arguably the best player in the Korean League this season as she finished with a game high of 28 points and 14 rebounds. Samsung looks to be in trouble after losing Thomas to injury. They may bring in a replacement player to share the load with Alexander until Thomas can return. Now that both foreigners can play together in the third quarter Samsung are at a huge disadvantage having only one foreigner player available to play. KEB Hana found themselves on a winning streak coming into this game against a struggling KDB. KEB took a five point lead into the half but KDB went off in the third outscoring their opponents 28-12! KEB tried their best in the fourth to make up for their terrible third quarter but the damage had been done and KDB won their second game of the season! Jewell Loyd led the winners with 24 points and 12 rebounds. Gwathmy finished with a double double in the loss. After a surprising start to the season, losing their first two games, Woori Bank has been a much better team each outing. 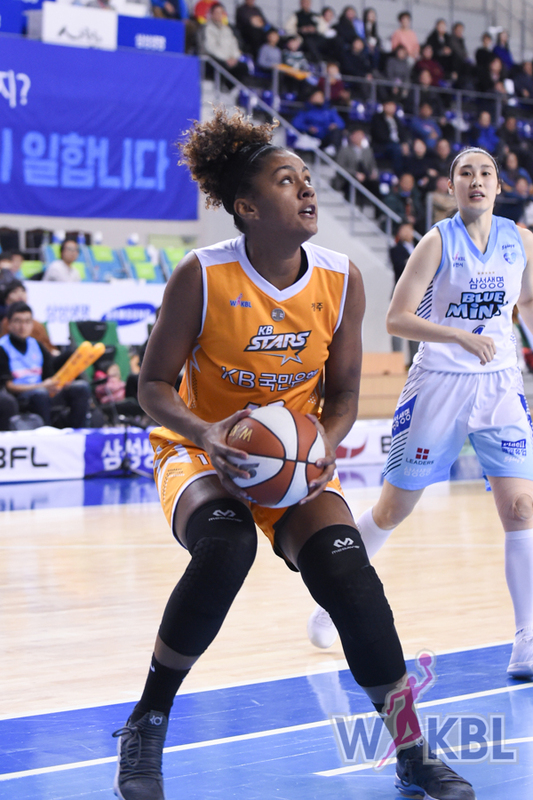 Facing Samsung at home who were down their leading scorer in Alyssa Thomas, Woori Bank used a third quarter surge to seal the fate of the game. Samsung hung in the game for the first half and even found themselves with the lead but the second half was all Woori who saw four players score in double figures. Kayla Alexander who had to play all forty minutes of the game finished with 21 points and 16 rebounds in the loss. After losing their first game of the season against KEB Hana in the last game of the first round KB Stars were back on the road against a Shinhan team who were desperate for a win. Shinhan started the game out much more aggressive than the visitors as they took an 11 point lead into the half. KB came out fighting after halftime and outscored Shinhan 11 to 20 in the quarter. They were only down by two points to start the fourth. Despite their efforts, Kayla Thornton was fantastic throughout the game. She led her team in scoring with a season high 37 points! Thornton made five of seven three pointers and had five steals on the night. After a hot start, Shinhan handed KB their second straight loss of the season. After losing their first two games of the season Woori Bank have taken their play to another level. Starting off great on the road against Samsung, Woori took a commanding 22 point lead into the half. Samsung played a much better second half but dug themselves too big of a hole in the first to climb their way out. 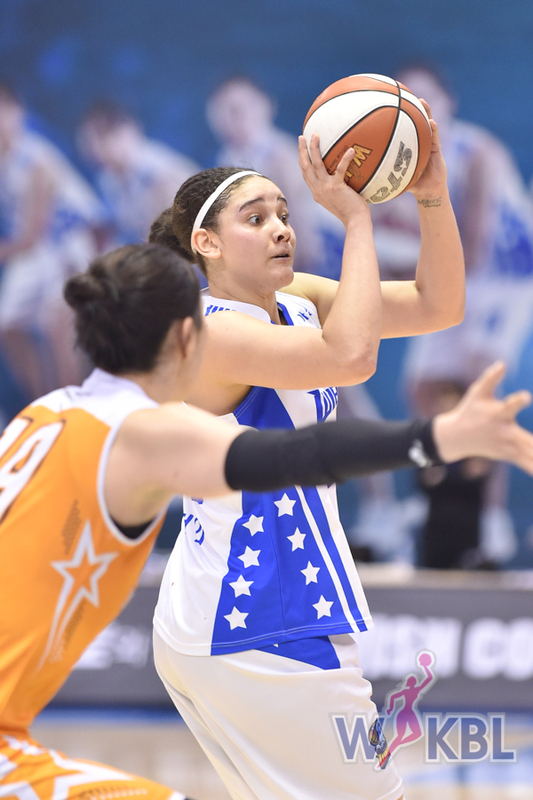 Alyssa Thomas again led Samsung in scoring with 23 points. Kim Jung Un led all scorers for Woori with 18. Samsung have now lost two games in a row. The first half remained close as both teams battled back and forth. Shinhan took a three point lead into the half. The second half was a different story as Shinhan put their foot on the gas and never looked back. 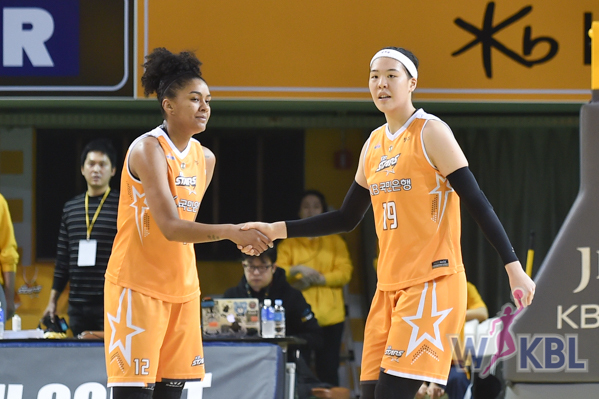 Scoring 33 points in the third quarter, lead by Kayla Thornton who finished the game with 29 points and 14 rebounds, Shinhan held their opponent to a measly eleven points in the third. KDB won the fourth but Shinhan came away with the win. KEB Hana celebrates their first win of the season. KEB Hana was the only team yet to record a win and they looked to be heading down the same road after finding themselves trailing by 18 at the half. However, a different team came out in the third quarter and KEB fought their way back into the game. Led by Jazmon Gwathmy who had a great third quarter, scoring 12 points, she helped her team win the quarter 28 to 9 and take the lead heading into the fourth! A sloppy fourth quarter by both teams in which they traded turnovers Isabelle Harrison took over and helped her team get their first win of the season. Park Jisu recorded her fourth double double in as many games. In a game that saw two undefeated teams meet for the first time this season KB was determined to avenge last year’s playoff departure at the hands Samsung. The highly anticipated match started out as many expect as both teams battled and ended up tied after the first quarter. The second quarter was all KB as they held Samsung to a lowly seven points for the quarter, taking a ten point lead into the half. The second half was all KB as they slowly pulled away from Samsung, leading by as many as twenty points at one point in the game. KB’s post play once again led the way as both Dantas and Park Jisu finished with double doubles. Samsung made a run but KB had too many weapons. The Stars are now the only undefeated team in the league at 4-0 with one game left in the first round. The WKBL held its annual foreign player draft Monday morning Korean time. Teams will still have two foreign players, but the rules changed significantly for this upcoming season as teams will be allowed to play more than one foreign player at a time for some portion of each game. Teams were also allowed to forfeit their first round pick to re-sign one of their players and give them a raise. The Samsung Life Blue Minx used this mechanism to bring back Alyssa Thomas. The lottery was conducted first to determine the order of the other five teams. As usual, it was a snake draft with the Blue Minx getting their only pick at the end of the draft. The first sign of a change in draft strategy came with the second pick, where Winnus opted for Jewell Loyd, knowing that they could pair her with a post player later, when they picked Chante Black. A number of veterans of the league were picked again as Kayla Thornton, Tianna Hawkins, and Monique Currie returned to the league and Shekinna Stricklen came back after time elsewhere. Teams also continued to look to some new blood with the option to re-sign players favoring teams that could find younger players. With the new rules, this season will certainly shape up to being more intriguing than recent years. Game 3 of the WKBL finals needed overtime to decide it’s winner. In an exciting matchup, Samsung saw three of its best players foul out of the game. Alyssa Thomas, Kimberly Han and Park Hana all fouled out leaving Samsung without their three leading scorers for overtime play. Samsung was on the verge of winning the game in regulation despite their foul troubles. After Thomas fouled out of the game, Amber Harris came in and gave Samsung valuable minutes and scored three crucial baskets down the stretch in regulation. Samsung was up two points with five seconds to play before Park Hye-jin was fouled on a drive to the basket that gave her a chance to tie the game with four seconds on the clock. Park hit both free-throws which tied the game and eventually sent it to overtime. In overtime it was all Woori, as Samsung lost all of its weapons. 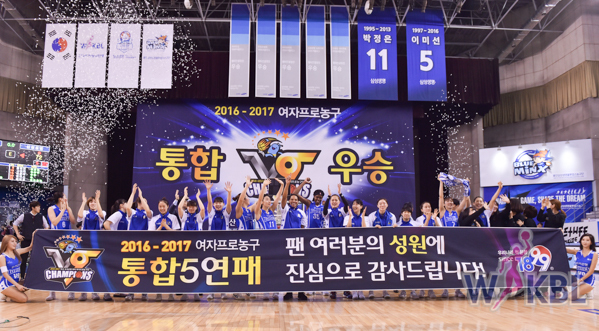 Woori outscored Samsung 15 to 4 in the extra period and thus winning the 2017 Korean League Championship. Jonquel Jones saved her best for last as she had a monstrous outing scoring 27 points and pulling down 25 rebounds! 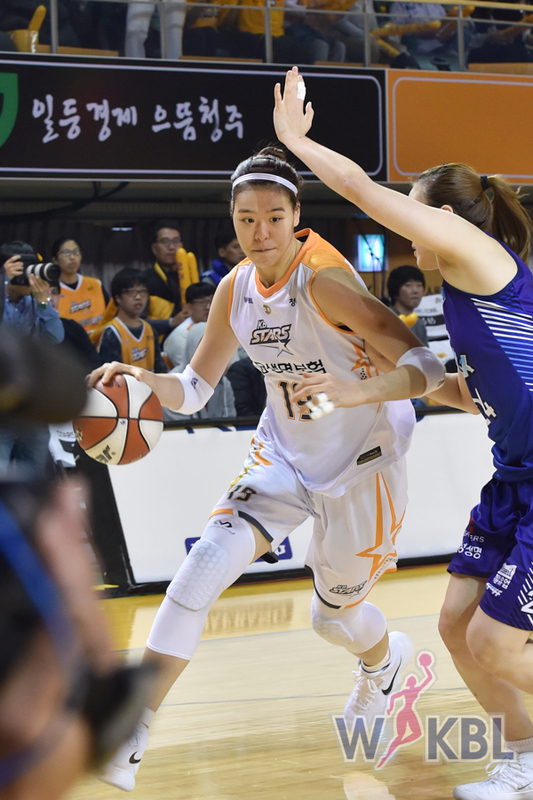 Finals MVP Park Hye-Jin flirted with a triple double with 19 points, eight rebounds and 11 assists in forty-five minutes of play. Check out some photos from the final game here. Game 2 of the Korean League Finals were back in Asan, home of Woori Bank. A sold out crowd was in attendance for Saturday’s game as Woori looked to take care of home court again against Samsung. Samsung came out strong to take the lead early in the first and hanging on to win the quarter by six points. Woori had trouble scoring as Samsung found a way to slow down Jonquel Jones on offense with their physical defensive play. The second quarter was all Woori as they held Samsung to just eight points and took an eight point lead into halftime. In the second half, Woori began to find their rhythm but Samsung hung around for as long as they could. In the end, Woori’s balanced attack secured their second win of the series. 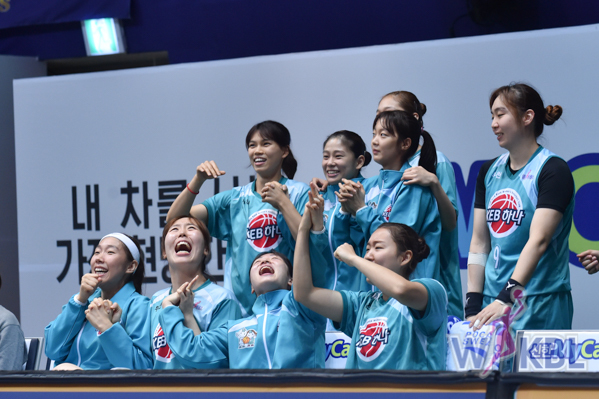 They are one game away from winning their fifth consecutive WKBL championship. Teams will change venues for game three on Monday night.